Well, we knew Monday was coming, so treat yourself to some much needed dark chocolate comfort. 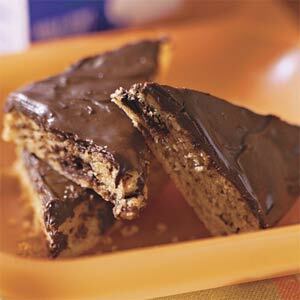 This pan cookie recipe calls for chunky peanut butter and dark chocolate morsels–a winning combination! 1. Stir together peanut butter, eggs, and vanilla in large bowl. 2. Stir in brown sugar until combined. Add baking mix and 3/4 cup dark chocolate morsels, stirring just until moistened. Spread mixture in a lightly greased 15- x 10-inch jelly-roll pan. 3. Bake at 325° for 20 minutes or until golden brown. Remove from oven, and sprinkle evenly with remaining 1 1/4 cups dark chocolate morsels; let stand 5 minutes or until chocolate melts. Spread melted chocolate evenly over top. Cut into triangles, bars, or squares.